MediaCrooks: NDTV : Train With The Best! The line below the pictures reads: "Train with those who have made the news for 22 years. 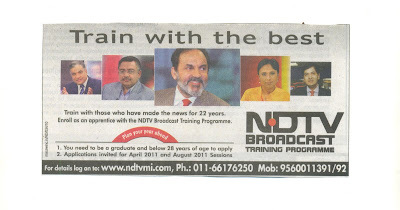 Enroll as an apprentice with the NDTV Broadcast Training Programme." It would have been funny if NDTV was deterred from advertising like this for want of takers. The fact that they have a trainig academy shows there are many a misguided people ready to join pseudo-liberal cult of journalism. The Parnav Roy “School of News Trading” is completely exposed to the knowledgeable viewers and only fools believe this channel. Barkha Dutt is now doing reviews of Books in her infamous "the buck-buck never stops show". Vinod Dua is best suited in the role of हम देश के लिये खाते हैं! The TRP he get for his stupid show Vinod Dua live, is only because of the old Hindi film song, shown in the end. Pankaj Pachauri His recent confusion is that he thinks that he is a financial expert. Vikram Chandra He is best in selling mobile and other electronic gadgets. 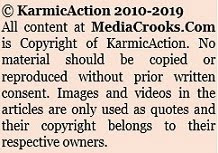 That is the only way to ensure TV channels shut down sooner than expected.A bunch of cheats and lairs are giving training. These news reporters should be beaten with chappals in front of their studio cameras and then shot. Now this channel will also announce Indian of the year 2010.By the way "Buck stops here" with Barkha Dutt is back.But as rightly mentioned by you important leaders of BJP are avoiding to be part of panel.Chandan Mitra should also not join in the panel especially Nidhi Razdan is back with her old tricks. Their products also, obviously might be prodigals, nonchalance for the nation. In a way, the advertisement is very apt. We have all figured out, haven't we, that these guys must have been "making news" (in the sense of manufacturing news) for all these years? And yes, it requires very special training, that of "erasing one's journalistic conscience"! So readers, here is what the ad is: Train with NDTV, in getting rid of your honesty and conscience, and learn to manufacture news! A bunch of cheats and lairs are giving training.